Every bride wants to look her absolute best on her wedding day and make-up is a big (albeit subtle) part of this. Most of the emphasis is placed on finding the perfect dress, and make-up is often neglected. This isn’t a problem if a professional make-up artist will be doing your make-up on the day, but for most brides, this simply isn’t an option. Simple make-up is the best option. It won’t detract from your dress, which is the main focus for most brides, and lets your natural beauty shine through. Unless you have lots of scars and blemishes that need heavy coverage, a light foundation should do the job. Concealer can touch up any remaining imperfections without creating a caked-on look. Setting this with powder is a good idea when you consider that your make-up is going to have to stay put through the ceremony and reception. While you’ll probably touch up your lipstick at some point, it’s unlikely that you’ll want to reapply foundation and concealer as they wear off. You’ll probably be glowing on your wedding day, but a soft blush is all you need for an extra helping hand. The appropriate shade is closely linked to your skin tone and hair colour. If you have pale skin, stick to pale pink and pale apricot shades. Pale pink is better suited to blondes and brunettes, while apricot compliments redheads with pale skin. For Asian and Mediterranean complexions, opt for apricot (for pale olive skin) or pale orange (for darker olive skin). For black skin, try a burgundy or wine shade as you can get away with wearing deeper colours. Avoid bright or strong colours, as they can be too harsh against a white dress. Neutral shades will subtly emphasise your features whilst making it look as though you’re not wearing any make-up. Neutrals tend to suit all skin tones. A coat of mascara will help to avoid the washed-out look that often happens if your dress is very white. Brown mascara suits those with pale skin as black can be too harsh, but black mascara will suit most other skin tones. Lipstick is another good way to add subtle colour to your bridal make-up. As with eye make-up, avoid colours that are too strong and overpowering (such as fire engine red), as the basic idea is to create a barely-there look. You still want to look like you, but an improved version of that, so look for a lip colour that is only one shade above the natural colour of your lips. Pale skins are often advised to choose a bold red lip colour, but you run the risk of that being the centre of attention in your wedding photos - rather than the dress you spent months searching for. A softer red shade is a better option, and will add still colour. Brunettes and redheads both suit deep shades, so warm terracotta shades are a good bet. Cinnamon and red-brown shades will also look good. Asian and Mediterranean skin tones suit red-brown and light brown shades, while black skin can wear much deeper and richer shades, such as rose or dark plum. Blot your lipstick before you apply a second coat to make it last longer. You can also dust powder over your lips before the second coat to help it stay in place throughout the day. You’ll probably find that you still need to reapply at some point though. You can switch to a more dramatic lip colour for the evening reception. 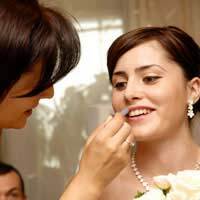 Keeping your bridal make-up light and simple will emphasise your features whilst creating the impression that aren’t wearing much make-up - even if you actually are. It also allows your wedding dress to be the focal point. However, you do need to get the right balance between too much colour and not enough or your wedding photos won’t be quite what you’d hoped for!